As a food blogger, some food you eat just makes you so excited to blog about them and Soirette makes one of those foods: macarons. I've found my favourite place to go for macarons! The only downside is that the location is not that convenient (unlike Thierry) since you still have to walk three blocks from the nearest skytrain station. I thought Soirette was a French dessert place (didn't research online, just heard great reviews from friends) but actually they specialize in macarons and have a few desserts like cakes on the side. I loved how neat and colourful the macarons looked all lined up behind the glass. 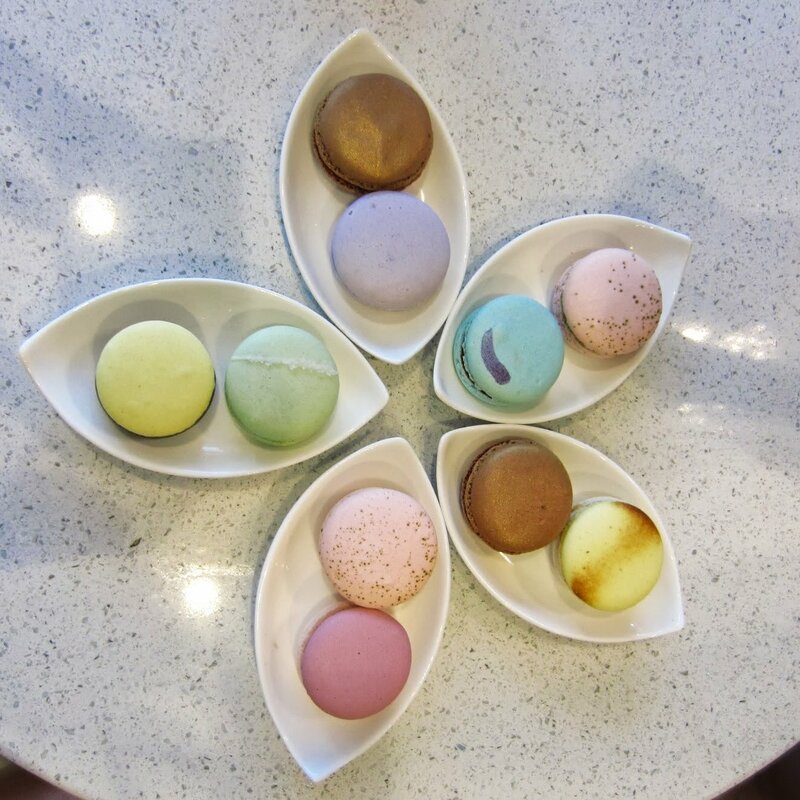 This is a photo of the macaron flower the five of us made with our macarons. Macarons cost $2 each excluding tax. The macarons I got were Fleur de Lys (pink one) and Early Grey Cassis (blue one). Honestly it was kind of hard to choose which macarons to get because all the flavour names sounded delicious but I chose Fleur de Lys because it reminded me of Fleur from Harry Potter! I was genuinely surprised by the Fleur de Lys because the floral aroma was so flavourful before, during and after biting. This is probably the first time I would describe a taste as pretty. The macaron was chewy on the inside (just the way I like it!) and slightly crunchy on the outside without being too sweet. YUM. I got the Earl Grey Cassis because I liked the cassis flavour macaron I tried at Bel Cafe before and it's not a flavour I would typically find in everyday foods. This macaron was aromatic and delicious as well but my favourite is still the Fleur de Lys. Overall, I cannot wait to try the other Soirette macaron flavours because they have turned me into a semi-macaron addict. Whoops.